More than six months ago, I had a dinner party and auditioned a then-new recipe for one of my favorite middle-of-the-freezing-winter dinner party dishes (short ribs) that was so good, I still weep a little when I recall it. I made a tarte tatin that was… well, it needed a little more cooking, and perhaps a Molly intervention And I made this onion tart, and we ate it with the cheese “course” and it was perfect in every way. So why are you only hearing about it today? Well, as is all too common when I have people over, I forget to take pictures. Any pictures. I have not a single picture of either dish from that night. I am still not over it. I have brought shame to the food blogger community. But when something is good, and oh, this was very, very good, opportunities will always arise to make it again. Like the fact that it’s Tuesday, and your friends cannot live on cauliflower salad alone. So onion tart it is, and you know what? It was even better this time. Onions that have been tenderly caramelized in olive oil for an hour with fennel seeds, crusted with some parmesan top a Dijon-brushed bready tart base, and it is a delight. My only regret? This guy who cleaned up the entire apartment after the party didn’t save the last two slices. But you know, I am bright enough to know better than to air a grievance with someone who washes dishes at 1:30 a.m. so I can take a nap on the sofa. Instead, I’ll just have to make more. Two years ago: Herb-Poached Shrimp, Cocktail Sauce, Summer Panzanella and an Artichoke and Yukon Gold Gratin. Yes, please! 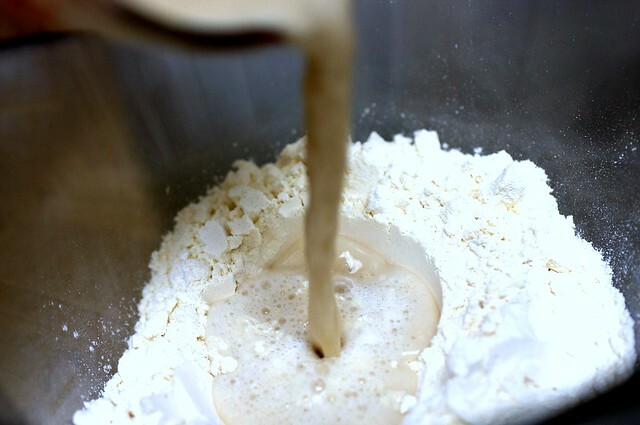 Put 1 1/2 cups flour in a medium bowl, then make a well in center of flour and add yeast mixture to well. Stir together egg, 1 tablespoon oil, and 1 1/2 teaspoons salt with a fork. Add egg mixture to yeast mixture and mix with a wooden spoon or your fingertips, gradually incorporating flour, until a soft dough forms. Transfer dough to a floured surface and knead, working in additional flour (up to 1/4 cup) as necessary, until smooth and elastic, about 5 minutes. Transfer dough to an oiled bowl and turn to coat. Cover with plastic wrap and let rise in a draft-free place at warm room temperature until doubled, 1 to 1 1/2 hours. While dough rises, heat remaining 1/3 cup oil in a 12-inch heavy skillet over medium-high heat until it shimmers, then sauté fennel seeds until a shade darker, about 30 seconds. Stir in onions, remaining teaspoon salt, and 1/2 teaspoon pepper, then reduce heat to medium-low and cover onions directly with a round of parchment paper. Cook, stirring occasionally, until onions are very tender and golden brown, 1 to 1 1/4 hours. Knead dough gently on a floured surface with floured hands to deflate. Pat out dough on a large heavy baking sheet (preferably blue steel) into a 15- by 12-inch rectangle, turning up or crimping edge, then brush mustard evenly over dough, leaving a 1/2-inch border around edge. Spread onions evenly over mustard, then sprinkle evenly with cheese. Ever tried an onion pie? 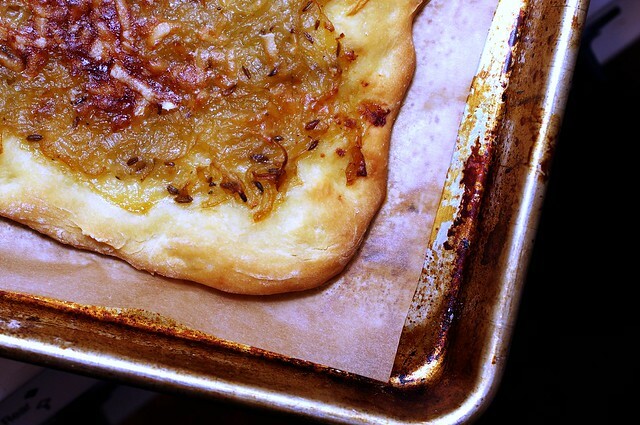 It’s the same principle I think… lovely caramelized onions and dough. Do you have to use the parchment round? I think I’d make a mess of it. Holy guacamole! That looks and sounds amazing. MMmmmm. See that looks really good. Equally as good as my pizza! Yum! This just rose to the top of the to-make list. I’ve been toying with the idea of yet another winter squash dish — a butternut tart, about which the sauteed onion component was all I really wanted. The butternut will keep… but this is next! Oh my goodness, that looks sensational! My mouth is watering now. I really need to try this out. Thanks! I love onion tarts, especially Alsatian Onion Tart. I love your yeast dough, I always make mine in with an egg custard in a pie shell. Salad and tarts go so well together. I like that you are posting more than once a week! I made this for Easter last year along with the entire accompanying menu, and it stands out in my mind as one of the best meals of the year. This is an awesome tart and would be just as great in fall/winter as with spring lamb. But Deb you can’t talk about a move-you-to-tears-of-joy short-rib recipe without sharing! You’re killing me! Even just a link? Pretty please? OH…may I second that request for the short rib recipe??? I love checking your blog,the pictures and ideas are wonderful. I am going to try your onion fennel tart,but I may slice up some fennel bulb with the onion… ps..short ribs!! I love any tart where you smear mustard on the bottom. I’m sold. Sounds delish….but I’m not a fennel lover. I might have to come up with an alternate herb/spice. Looks beautiful. This tart is screaming for goat cheese. Maybe because I used to make a carmelized onion, rosemary and goat cheese foccacia. But I love the addition of an egg to the dough and the fennel and mustard sound perfect! I can’t wait to make this and will blog in again when I do. I think I’ll serve with goat cheese rather than bake it on. Jessica- give thought to rosemary in place of fennel. It’s quite nice with carmelized onions. I’ve often used dried for this type of dish. Whoops, I forgot, rosemary too, would thyme work???? yum – this looks fantastic!! Can’t wait to try it! I love the pictures one hot hot hot recipe. i’ve been wanting to make this since i saw the recipe! yours look terrific, even better than the original! I am embarassed to say I have never tried an onion tart! Gah, I need to try these soon….looks delicious. Just back from the bar after two large beers. I’m craving this now…. This looks and sounds wonderful. I’ve never used fennel, ever! but from having had Italian sausage where I could detect the slight licorus flavor that it lends..I can imagine that paired with the slight tang of mustard and sweetness of onion it would be something I would really enjoy. The dough sounds like it could be a richer version of a focaccia..or thicker pizza? I would be the first one to taste this. I love onions in anything. Looks yummy. I must tell my hubby: THE ART OF THE TART is NOT LOST!!! YUM! This reminds me a lot of the german zweible kugel (sp?). It has bacon on it though. And the crust is a bit different… so yummy though! Oh yum and you’ve just reminded me that I haven’t made an onion tart for ages – may have to rectify that quite soon. My favourite is a Nigel Slater recipe of buttery caramelised onions with thyme and taleggio on a puff pastry base. Ok, umm…how to say this…umm. I want to make this but I just don’t “do” Pastry, dough or the likes. I love the idea of the onion tart but if I were…say, wanting to use a premade crust (ducking….ouch, those stones hurt …Please stop!) Is this like a puff pastry or more like a pie crust? I love the addition of mustard and fennel seeds (my favorite). I’m definitely going to try it. Thanks! Oh, how I love sweet, caramelized onions. This looks delicious! Oh my, how scrumptious! I made an onion tart a few months ago, but kneaded fennel seeds into the dough itself and caramelized the onions with a touch of apple butter and dijon. There is no scent more enticing than onions and butter getting to know one another better in a skillet. Bliss. I don’t usually like onions but I had a tart once made according to Alice Waters’ recipe and it was delicious! This tart reminds me of the one I tried. What is a “blue steel baking sheet”? where can I purchase it? This looks so yummy, I can’t wait to try it. this is my favorite kind of recipe. looks devine! Why are the onions covered with parchment paper while they’re cooking? Wouldn’t the paper burn? Could you just use a lid? You can also use a lid that is slightly ajar instead of the parchment. However, the parchment doesn’t burn–there is too much moisture and it is not in direct contact with any dry heat. As for the blue steel (heh, all I can think of is Zoolander), it is supposed to be a tougher kind of steels but I can tell you that I have not a clue as to which kind of steel my baking sheets are. I think what the recipe means it that if you have something heavier than a standard cookie sheet to bake on, use it. Otherwise, I suspect a pizza stone underneath would help the crust along. I noticed parchment paper under the tart while still on baking sheet. Should we also bake on parchment paper? I don’t think it is necessary. I just like it because my baking sheet is (as you might notice) old as (and not much prettier than) dirt and I like to think I’m insulating my baked goods from it a bit. Sindy – Can you get frozen pizza dough where you are? That should do nicely. I actually still have that issue of gourmet out and about in my house – sometimes in the kitchen and sometimes on my bed table. I loved the article about the Jura (even though I don’t remember if that’s the actual name..) And I made that onion tart from the magazine – It tasted so good in the making but was so incredibly salty when cooked that I was not happy. I’m going to give it another try though – maybe I messed up – maybe your tips will help me. Re, the short rib recipe: I promise to make it again soon. It’s not on the site already. In fact, I have two favorites–this one and another one that’s much simpler. As soon as the temperature dips below, say, the 65 degrees it is today I’ll be craving them again! Re, the crust: I think a pizza dough would be just fine as a replacement. If you can’t find one in your grocery store, go to a local pizzeria and they’ll always sell you one. I think the extra breadiness is essential to balance out the wetness of the caramelized onion mound–a short crust wouldn’t work as well. Oh my gosh, I want to kiss you. That looks simply divine. Using cheap onions and dough and coming together to look like such a sophisticated meal- I’m all about it. My goodness, this just got added to the post-thanksgiving party menu! Thanks for not beating me up for not making my own crust :0). Yeast just scares me …lol! ohmygoodness – i now have to open a smitten kitchen folder in my bookmarks because i bookmark every single recipe of yours! this looks amazing! Christy: You are right! It’s kind of like Zwiebelkuchen, meaning onion cake or onion tart. Which is very popular in Germany, but I think it is actually Alsatian, originally…just like sauerkraut…. for zwiebelkuchen you first caramelize the onions and then add a little beer let it simmer for a while which gives a really nice depth of flavour. but i’ll definitely give this version a try. 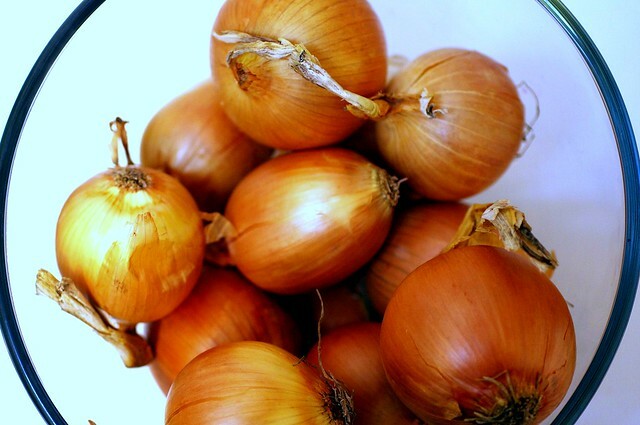 Onions are such an appropriate food for the colder days ahead of us: they can be spicy or sweet, pungent and savory. I especially love the smell of onions cooking in butter with spicy Spanish paprika. Thank you for sharing this recipe with us, and for all of your food inspiration here. It does the soul good to read a blog that shows such obvious appreciation for food. I made this yesterday and served it today and it disappeared in minutes! Thanks for such a fantastic tasty recipe! Can this tart be made a day before (or frozen), and then heated up just before serving? This was a big hit today, despite the copious chopping-which I assigned to my grandmother and which, thankfully, kept her busy the better part of the day. It was a bit too spicy for us though-and we wound up cutting it with yogurt. Does that come from the fennel? We’re going to make it pareve for thanksgiving with the addition of mushrooms. Any advice for cutting down on how spicy it is, or should the mushrooms do it? So great! We made this on the weekend, we added some horseraddish to the onions… we’re used to eating really spicy food in australia…. We have smitten kitchen sundays where we cook a recipe from you deb.. Thanks for being beautiful! This reminds me a bit of a recipe for an onion tart by Todd English that is wonderful! I’ll have to give this a try. This recipe – along with a bottle of red wine – my amazing weekend, by acting as one of the best dinners i’ve made in a long long time. i’ve been following your site for a while, and i love it. but deb, is there any way you can post in Grams/ML/Celsius as well for your European counterparts? As an american expat living in Holland, I’ve had to leave cups and tablespoons behind! This recipe – along with a bottle of red wine – completed my amazing weekend, by acting as one of the best dinners i’ve made in a long long time. I made it! Wow. That was an adventure. I hope it tastes as good as it looks. I love reading this blog, but this is the first time I actually have attempted to replicate anything on it. Yippee. this looks absolutely amazing (and i love the way you cut it)! this is going on my list for sure! This was very tasty. I think it would make a good appetizer, cut into small squares and served room temp. We ate it more like pizza, as a whole meal, and I probably wouldn’t do that again because it was too much of the same flavor to eat more than a couple small pieces. It took a really long time to caramelize the onions, about 1 1/2 hours at least. Next time I would use a little less oil, maybe 1/4 cup instead of 1/3. I increased the amount of mustard- good decision. I also used white whole wheat flour, which worked very well. I only wish I’d rolled the dough out even thinner. It seemed really thin, but fattened up a bunch in the oven. Easy to make and cheap! Any tips for avoiding the terrible effects of onions on the eyes? When you peel the onions, DON’T cut away the “roots”. I made this yesterday to take to a dinner party and it disappeared in a snap. I used 1/3 whole wheat flour and instant yeast in the crust and mixed and kneaded it in the Kitchen Aid stand mixer. When I make it again, I’ll knead it a bit more and bake it for five more minutes. Still, it was almost perfect and the onion/mustard combination was delicious. I even got asked for the recipe. Make this and enjoy. Hi Deb, one more stupid question.. may be two : do you really mean cooking (rather frying) the onions in 1/3rd cup oil for 1 hr (and more?)? I never made a tart before and i am curious (almost drooling – because i love fried onions) and waiting to make it for a few friends day after… so i hope I will be able to do it well :). Well, frankly, so far, I haven’t been dissappointed by your recipes, so hopes are high. Well, my next question is how different is Dijon mustard from normal mustard – I often use a very good quality of mustard powder (sometimes mixed with a little yoghurt to form the paste and tone down the sharp flavour) – would it make a lot of difference if I replace this with the Dijon? I really have no idea about Dijon.. could you help? Yes on the onions. You want them to very slowly caramelize. Dijon is made in its own way, with certain seeds from the region, blended with wine, vinegar and unripe grape juice (there are many sites dedicated to explaining how it is made if you do a quick search) — when you say “normal mustard” I’m not sure if you’re speaking of something like Dijon or something, say, closer to ballpark mustard. Nevertheless, I am sure this recipe is adaptable to use with whatever kind of mustard you prefer. Why isn’t there an easy way to print? Nevermind! I found it! This looks yummy! Made this. In heaven. Thank you. I just made this with dried thyme leaves instead of fennel (what I had on hand) and it was really wonderful. I love recipes that are so simple an inexpensive like this. The time is what does the work for you in both the dough and the onions. Very easy, very delicious! I searched your site for Fennel, as I had the stalk left over (used the bulb for a different recipe last week). I used purple onion, used 2 instead of 3, and then added the fennel stalk to the carmelizing step. The flavor of the tart was fantastic. I was especially pleased that with easily 3/4 inch of onion/fennel on top of the dough, that the dough crisped up so well! I used a regular cookie sheet on the middle rack of the oven. My guests were very, very impressed. I finally divulged how ridiculously easy this was and how I didn’t shower before they came, nor did I have to go to the store. Awesome! This is really delicious, I made these for an appetizer once and they stole the show! Made this over the weekend as an appetizer for my annual holiday party. Big hit. I’m just sad I didn’t get to eat more of it myself. Will definitely be making it again. Left out the fennel seeds because I’m not a huge fan and the mustard still gave it plenty of flavor. Might throw in some chopped thyme next time. Yum yum. Thanks as always! This turned out AMAZING! I just used up the last of my packs of active dry yeast and wont be able to get anymore for a while (I live in China). Is it ok to substitute instant dry yeast (i.e. SAF)? p.s. 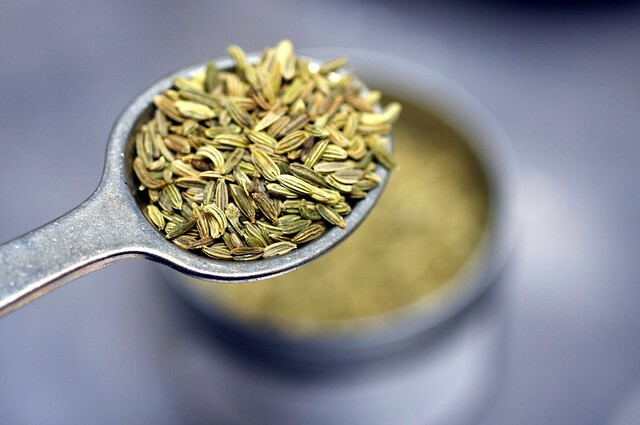 To all those that didn’t use the fennel seed – I don’t like fennel at all but just added a bit anyways to see how it would turn out (I trust your taste buds Deb!). It works perfectly and doesn’t really have that overpowering fennel flavour. Trust me – throw in a bit and it just starts to smell wonderful. Hi Deb, I know you mentioned you could do the prep a few hours before. What is your view on cooking the onions and making the dough the day before? I don’t see why it wouldn’t work. Keep the dough in the fridge. Warm the onions gently. I made this last night and absolutely love it, though my yeast did not froth. I threw it out, and started again, then I decided to err on the side of safety and add a spoonful of sugar to it, and lo and behold, it frothed like a charm. It was a bit of a cold day but I put it in a warm place, no idea what went on there but anyway, this is delicious, so much better than I thought it would be. I love caramelised onions, mustard and fennel but wasn’t sold on the yeasted base. I stand corrected. I love SK! Can’t believe how amazing these turned out. Half an hour later, im still shakimg my head at how well all the flavours came together in perfect harmony. You are a genius! I was inspired by this last night when looking for an update to my standard caramelised onion tart – I used a fennel bulb instead of the seeds to cook with the onions, and topped it with goats cheese and thin rounds of potato instead of parmesan. I know it might seem like a completely different dish, and I suppose it was, but the flavours (onion, fennel, mustard, pastry) still came together really wonderfully. I’d love to make your authentic version next time, too! I would call this a Pissaladière – a tart condiment-laden and filling-light south French pizza. This rendition looks wonderful. I made this for a couple of friends yesterday. Added more flour to the dough because it didn’t seem to come together, but in the end it worked out great. Looking forward to eating the leftovers for lunch. Thank you! I made this yesterday and it tasted great. I used pre-made whole wheat pizza dough and drained the cooked onions in a colander to remove some of the oil before placing then on the mustard-spread dough. I might drizzle with white balsamic vinegar after I bake it next time. Love the sound of this. I really don’t get on with yeast cooking so I’m going to try it with several layers of filo pastry instead. On the list for this weeks supper. I made this a couple days ago. It was really, really delicious. Flavors meshed together really well. Used fennel powder instead of the seeds and still worked out well. I put 2 tablespoons of mustard and that was great. Added some artichoke hearts cut in quarters (stir fried them the last 5m with the onions) – I recommend doing this to make it a full meal. Fried egg on top for protein works well here too. Can’t recommend this recipe enough. Thanks for posting, Deb! Deb–Any tips on how to adjust ingredients if I leave cheese out? Dying to make this. Thanks, in advance, for your help! Joanna — I had to reread the recipe because I had NO recollection of it containing cheese — that’s how minor of an ingredient it is. You can absolutely skip it. Added fresh sliced fennel and leeks to the onions as they caramelized, then sauteed up mushrooms with a shallot and some fresh herbs and layered that over the onion mixture topped with grated pecorino romano. Exellent! Any thoughts on making this without an egg in the dough? But I substituted puff pastry sheets for the dough because it was a time-saver. Everything else stayed as written. It was a BIG hit with guests and family. Deb, you’ve done it again!